Do you believe? Do you want to believe? 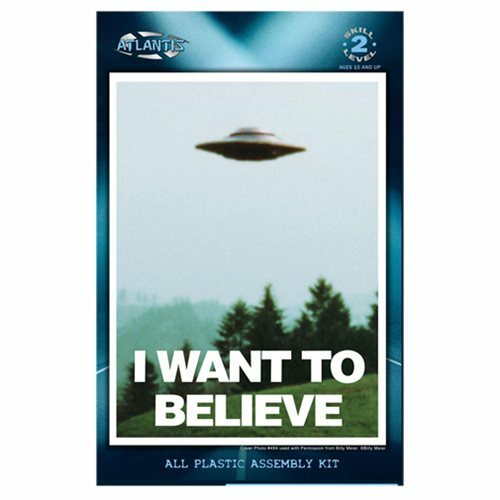 Then this awesome I Want to Believe Billy Meier UFO 5-inch Model Kit with Light is for you! From Atlantis Models 5-inch Saucer Series, and based on the world-famous photo by Billy Meier, this 5-inch diameter plastic kit includes a poster-like backdrop for display. Featuring easy Twist-Tite assembly, there are 2 pieces for the saucer and 4 pieces for the included stand, plus an LED blinking light for night-time illumination! The beautifully designed display stand will fit all the saucers in the series, and it can support many other larger flying saucer model kits currently available. Other saucers sold separately. Skill level 2. Ages 15 and up.